Walking off a surfeit of Christmas Cheer today, I came across these fruiting bodies. At first glance these looked like some Funnel Caps, however the gills were forked which ruled out Clitocybe. 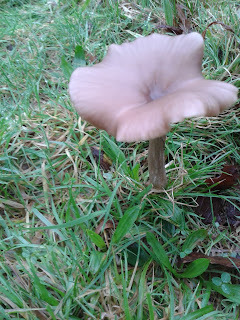 Nevertheless it does explain the name Pseudoclitocybe. Just to confuse me a little bit more some of the literature describes these as a woodland species, however a quick look at the FRDBI revealed they seem to be more often found in grassland as were these specimens. My books say "a common Winter species", but this is the first time I have found them on my little patch! Great! Is this what Bruce posted on Dec 14th from Black Mountain? This name was suggested by David Harries --- time of year. Not a species I am familiar with ---Pseudoclitocybe cyathiformis and book descriptions confused me. That thought had crossed my mind as well - hard to say without a specimen in front of me, but a distinct possibility.